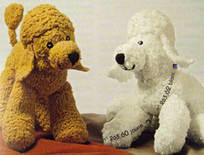 Toutou the gentle poodle knitting kit from Bergere de France is approx 28cm high, knitted in Teddy snowflake yarn, either white or honey coloured. Kit contains yarn, instructions, stuffing, buttons for eyes, in presentation box. 4mm needles required, not included.